Court Orders: Must you Appear? Without the proper legal awareness needed to stay in compliance, you may face grave legal and financial consequences. This seminar will show you how to continue to help the people you’ve been trained to help while still protecting yourself from many legal pitfalls. If you attend only one seminar this year, make it this one. 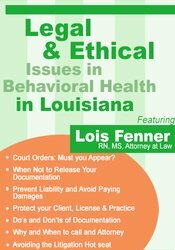 Join attorney Lois Fenner for an entertaining and enlightening day and leave with a greater understanding of the latest Louisiana laws as they relate to behavioral health. You will take home practical strategies to minimize and manage legal and ethical risks and you will learn how to immediately implement these risk reducing strategies into your practice. Communicate how to comply with HIPAA regulations. Determine the process for responding to subpoenas and court orders. Articulate the rights of minors and parents in mental health treatment and legal determinations. Specify the role of the mental health professional in the commitment process. Develop policies on ethical issues such as restraints, seclusion and informed consent. Designate the treatment provider’s responsibilities relating to mental health issues and the legal duty to warn. When May I Release Records? How Much Paperwork Will This Be for My Office? Lois Fenner, R.N., M.S., Attorney at Law, is an honors graduate of the University of Maryland School of Nursing Graduate School and the University of Maryland School of Law. She is an attorney and Registered Nurse, Certified Clinical Specialist. Ms. Fenner is a member of the Maryland Trial Lawyers Association, The American Nurse Attorneys Association, Women's Bar Association, past president of the Monumental City Bar Association, Phi Kappa Phi and Sigma Theta Tau Honor Societies and the National Exchange Club. She has been recognized by the Alliance of Black Women Attorneys with the 1997 Distinguished Women in Law Award, the Baltimore Marketing Association Harold Young Leadership Award in 2000, and the Baltimore County Diversity Award in 2001. Additionally, she is a three-time recipient of the Daily Record's Top 100 Women in Maryland Award, and has been recognized as a Baltimore Business Journal's Who's Who in Law in 2003. She was selected as one of the Super Lawyers in 2009 and 2010. Her practice focuses on medical litigation and health care to include medical malpractice, personal injury, accreditation, workers compensation, wrongful death and licensure issues. Financial: Lois A. Fenner is in private practice. She receives a speaking honorarium from PESI, Inc. Non-financial: Lois A. Fenner has no relevant nonfinancial relationships to disclose. This self-study course includes 5.75 hours of state specific ethics instruction. Not all boards allow ethics credit for self-study products. If ethics is not specified within your licensing board’s approval statement below, please contact your board to determine the applicability and amount of ethics allowed. PESI, Inc. designates this self-study activity for a maximum of 6.0 AMA PRA Category 1 Credit(s)™. This activity was originally recorded on 01/18/2019. It was last reviewed on 12/21/2018 and is valid until 12/21/2021.